Train your Saint to walk on a leash, so he doesn't take you for a walk instead. 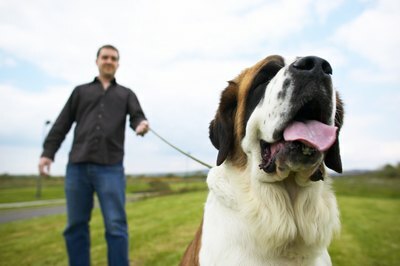 Once you get past the drool, you’ll find that your Saint Bernard is intelligent, loyal and loving. Because he’s going to be a very big dog, some training is in order. This lumberjack of a dog lives to please, and with early instruction, soon becomes a well-behaved family member. Puppy kindergarten, if available, is the best way to teach a baby Saint to behave. Adult dog obedience classes are okay, too, but while your puppy is large, he won’t emotionally mature until he’s nearly 18 months old and he might be fearful around adult dogs, even ones that are smaller than he is. If no local classes are available, take your puppy at least twice a week to a dog park or another place where he can interact with other dogs and people. At the very least, he should learn how to walk on a leash without pulling and "sit,” “down” and “stay,” on command. Saint Bernards love to play. For the most part, they’re naturally cautious and careful, but because even a single adult Saint Bernard paw is heavy, don’t let your puppy jump up or paw you. Monitor play with small children, and if your Saint Bernard inadvertently knocks a child over or plays too roughly, end the play session. You can only expect so much from your pup, so a little training of the kids is also in order. Teach them to throw a ball for a game of fetch and show them how to treat the dog with respect. Encourage activities that don’t involve roughhousing. No one wants to step inside someone’s house only to be accosted by a barking, slobbering giant of a dog. You can’t teach your Saint not to drool, but you can teach him not to imitate Cujo. Because of his size, train your pup to sit down and not to approach visitors that come to the door. You can recruit a friend or family member for training practice, and reward your pup with treats, praise and tickles every time he gets it right. The same thing goes for letting him sit on the sofa, sleep on your bed or sprawl on your lap. If you allow these behaviors when he’s young, he’ll want to continue them when he’s fully-grown. A well-behaved Saint Bernard is a treasure of a dog.